B. caspica is slightly larger than B. barbastellus, with taller and narrower ears and missing a lobe on the outer ear. It occurs in more arid habitats and can sometimes be found in caves, crevices and mines. 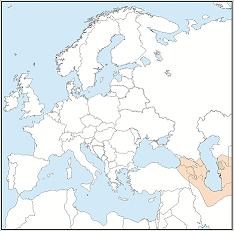 This species occurs in the Caucasus and eastwards south of the Russian Federation and in the Middle East.